Cutting the Fed Funds target rate from 6.50% in January 2001 to 1.0% in June 2003 may have inflated the US stock market out of its bear market when priced in dollars but it had consequences. Cutting interest rates to get the US out of a recession may have worked but the inflation in commodites and devaluation of the US dollar it caused has caused pain for the US consumer. This pain is often blamed on president Bush who took office just as the DOW/Gold ratio broke out of the "symetrical triangle" pattern, explained below. may have the majority of voters in the US ready for a change, even if the change (raising taxes) hurts the economy in the long run. Subscribe TODAY and get the May 2008 issue for FREE! Oil prices fell today on inventory news that should have been very bullish. Often tops and bottoms occur when stock price action diverges with the news, like we saw today. This article explains some methods that should profit from falling oil prices without the risk of shorting futures or even the need to open a futures account. 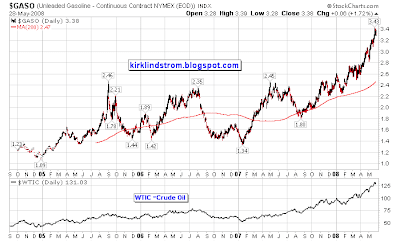 First, do you think Oil prices have peaked? Do you think gasoline prices peaked near Memorial Day, the traditional start of the summer driving season? Gasoline prices here in California often peak on Memorial Day. If you answered yes, then one way to trade this belief is to buy airline stocks. The chart below shows airline stocks have fallen faster than oil prices have gone up. 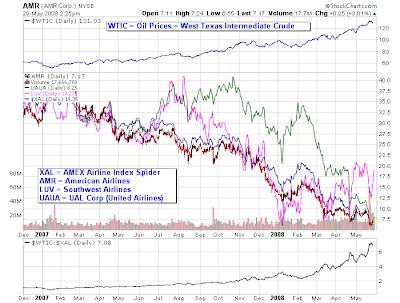 The graph shows XAL (the AMEX airline index,) American Airlines (AMR), Southwest Airlines (LUV) and United (UAUA) have all fallen far more than oil prices have doubled since December 2006. To remove the specific stock risk of an airline going under, I'd buy the exchange traded fund, XAL. Alternative Idea: Short First Solar (FSLR Key Statistics) if tight stops take you out 2% below my dashed blue support line. If someone put a gun to my head and asked me to recommend a stock to short to take advantage of falling oil prices, it would be FLSR with an 8% stop loss and a target to cover of about $125 where it would have a PEG of 1.0 if you believe a company can grow at 45% a year for five years. A company with a $20B market cap will have a hard time growing at 45% a year without a ton of competition attacking their margins. Also, the current price already reflects near perfect execution of a very bright future. I'd look for a 50% gain (50% price decline after breaking support) for an 8% risk. If you own solar stocks, then you may also want to put in very tight stops and consider going short if support is taken out. Some of the solar stocks are trading years ahead of fundamentals much like NASDAQ stocks were in March 2000. First Solar may have made a double top or it could find support at the 200 day moving average, but at 34 times sales, a PE of 102 and a PEG of 2.0 on a 45% growth rate, it is not cheap and would not be cheap even at half its current price of $256. Shorting FSLR with an 8% stop loss could be safer than owning airlines. All are risky trades that nobody should attempt without using stop losses to protect you should you be wrong on the direction of oil prices. Go long FedEx for a safer investment: Even if oil prices go down, airlines have never been a very profitable business for shareholders. You may want to own a stock like FedEx (FDX) instead. It has been much easier to make profits transporting packages than people who may put bombs in their shoes or box cutters in their carry-on luggage. FedEx should also benefit from high oil prices in the long term as more people will shop on the internet to save driving. Even if oil prices remain high, FedEx will eventually raise prices and return to growing profits. Airlines wish they could remember what it is like to be profitable. I am not making a recommendation here to short FSLR or to go long airlines. This is a "how to" article for those who are looking for ideas. I believe there are "safer" ways to make money. I prefer taking my high risk with technology stocks rather than airlines that have never been good investments. 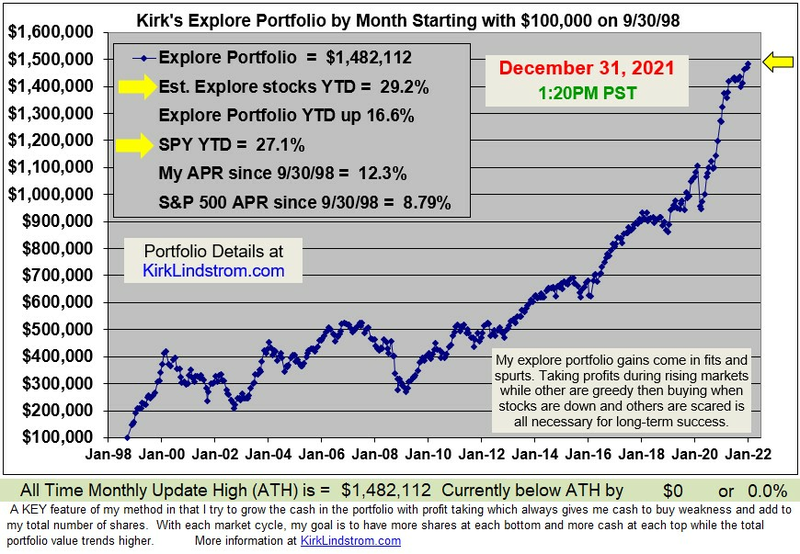 My speciffic recommendations are in "Kirk Lindstrom's Investment Newsletter" where I have profited on rising oil prices with other investments like VLNC (see "Valence Technology: A Green Stock with Potential") that I've taken profits on and have stops in to protect gains already similar to what I recommended for FSLR investors who have great gains now. Disclaimer: I am long FDX with very large gains from buying long ago when I correctly guessed it would benefit from internet commerce. FDX has corrected significantly on the economic slowdown combined with jet fuel going up faster than they can increase fuel surcharges. If oil falls in price and the economy starts to grow again, FDX would see a 33% gain just getting back to the highs it hit many times in 2006 and 2007. Some people on TV are blaming the Federal Reserve's easy money policy for the record prices for oil. 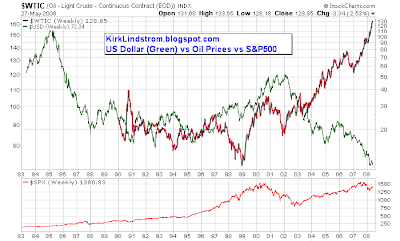 The chart below of the US Dollar vs. the price of oil (WTIC) vs. the S&P500 shows between early 1995 and January 2002 the US dollar gained nearly 50% when it went from just over 80 to 120 while oil prices were volatile but flat to higher. For more information, see "Stock Market Returns After Oil Prices Double in a Year or less"
If a falling dollar makes oil more expensive, then you would think a gain of 50% would make oil cheaper. As the chart shows, it is not that simple as oil prices went up considerably between the mid 1990s and the early 2000s but for a brief dip under $20 during our short recession in 2001. For sure a falling dollar makes importing oil more expensive but it is not the main reason oil is so expensive. Oil is going up because supply is limited and demand is growing. A falling dollar simply makes us less competitive bidding for oil against other countries that have growing economies with stronger currencies. Drill where we know there is oil in the US such as ANWR and off the coast of California and Florida. None of these solutions are painless but we must do all or some of them unless we want to transfer the great wealth our nation has accumulated in the past 200 years to others in a single generation. An investors _______ size is the dollar value being invested into a particular security. "position" .... duh... same as last week! As of Friday's close, oil prices are up 103% in the last year. Investments that have done well with rising oil prices were correctly predicted in the book "The Oil Factor." I was given the book, "The Oil Factor" back in Feb 2004 to review and perhaps add it to my recommended reading list. I liked the book so I had it on my recommended reading list for several years and I recommended it in my writing. 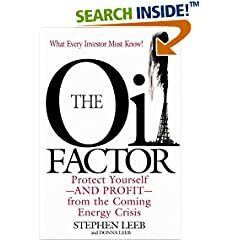 "The Oil Factor: Protect Yourself AND PROFIT from the Coming Energy Crisis"
Worth the price of the book for the historic data in a bar graph on pg 17, Ch2. Their recommended assets included energy stocks, that included REITS for inflation and Warren Buffett's BRKA, have done quite well. 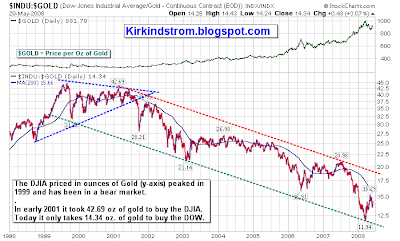 Obviously, the oil companies and gold have been great investements since their book was published in Feb. 2004. I made good gains buying GeoGlobal Resources (GGR $3.27) in 2004 between $0.95 and $2.25. GeoGlobal is a Canadian natural gas driller operating in India. I took massive profits in 2005 selling most of my shares all the way up to the mid teens ($13.65) before GGR collapsed so I got my energy profits front-loaded (I took enough profits to buy a Prius or two) but the slow, steady gains in the energy stocks the Leebs recommended in their book have done great also. 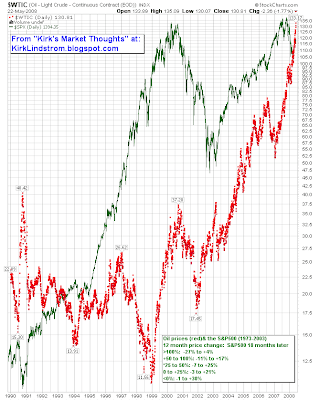 I also own and have recommended REITS as a core position in "Kirk Lindstrom's Investment Newsletter" since early 2001. REITS have done very, very well as an inflation hedge. 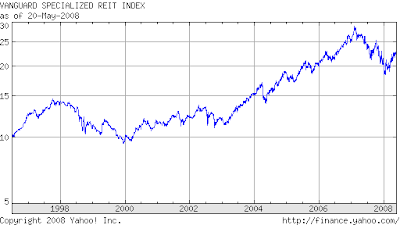 Vanguard shows $10,000 invested in their REIT index fund on 1/1/2001 is now worth about $30,000. The above chart doesn't show the dividends reinvested. REITs currently pay an effective yield of 4.15%. For the last 5 years, VGSIX has averaged 18.17% a year through 4/30/08! Product Description: Stephen Leeb shows how hard times can be a boon for smart investors. As the world faces an energy crisis of unprecedented scope, renowed economist Stephen Leeb shows how surging oil prices will contribute to an economic collapse. With meticulous research and analysis, Leeb shows that due to strong competition from India and China, prices could soon double, a cost for which most countries and investors are ill-prepared. Now, in this groundbreaking book, Leeb not only shows how this crisis will affect consumers, but how savvy investing can turn these dire times into financial gain. He was right, oil prices did double and the S&P500 has struggled. Click to view the full sized chart showing the price of oil plotted against the S&P500 from 1990 through Friday May 23, 2008. 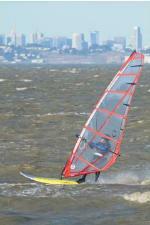 Subscribe TODAY and get the September 2008 issue for FREE! On the MACD indicator, a reading above _____ is considered to represent positive momentum. Today in a brilliant piece of reporting, CNBC's Becky Quick (see Anchor Women of CNBC) interviewed Warren Buffett live in Omaha, Nebraska asking questions as if she were some famous people. As US Treasury Secretary, Henry (Hank) Paulson: Excuse me Mr. Buffett, do you think the stimulus package is enough or do we need to come up with a second stimulus package? Warren Buffett Answered: “I don’t think the stimulus is going to do an enormous amount of good. In fact, most people should pay down their credit cards when they get it.” Buffett went on about how dropping money on people can cause problems with future inflation. “Anybody that is paying 15 to 18% on their credit card is out of their mind to not pay it down with the money.” Buffett said they need to be careful about the consequences on inflation from using this tool. As GOP presidential hopeful John McCain: “Is there anything I can do that would make you think twice” about supporting Obama or Clinton. Buffett indicated he might reconsider if McCain decided the tax burden should be shifted away from the middle class and poor to the super rich. Buffett went on to say he ‘votes on the issues” but it was clear from his response he was not going to change from a life-long Democrat unless the Republican candidate had a lobotomy and joined his party. As Microsoft (MSFT) Chairman Steve Ballmer, Quick asked if deciding to walk away from the Yahoo! (YHOO) deal was that the right negotiating tactic or thing to do. Warren Buffett Answered: “Well I don’t know if this is a negotiating tactic. I think he may have decided he may have gone as far as he can go. “Buffet went on to explain you have to have limits and know what they are for you when you go into a deal. Buffett said the shareholders of Yahoo! could come back to him in six months like Sees Candy did for him in 1972. Buffett said he means it when he walks away. He walked away from Sees when they wanted $30 million and he only wanted to pay $20 million. He walked away and fortunately they came after him. Becky asked if there was a chance the ECB is “behind the curve” just like the Fed was too slow to cut rates? Warren Buffett said Trichet could be wrong but he probably has his own set of data that indicates inflation in Europe is a problem and he’s seen how hard it is to put out run-a-way inflation once it gets started. As JP Morgan Chase CEO Jamie Dimon: “Do you think I made the right move to step in and buy Bear Sterns. Warren Buffett said “socially” the Fed made the right move. If they had not stepped in that Sunday then the following week may have been something like Wall Street has never seen. Quickie #1: Do you think the economy in the mid West is better off than other places? Buffett A1: Yes because we didn’t have the housing bubble, there are jobs and our furniture business is booming. Quickie #2: How much were Berkshire Shareholders spending at the annual meeting? Buffett A2: They were buying 1.5 pairs of boots per minute and jewelry every nine seconds. Almost all the places selling goods at the annual meeting broke records and exceeded expectations. Quickie #3: Is there a commodity bubble? Quickie #5: Comment on Barrons Cover speculating on who the next chief of Berkshire Hathaway. Buffett A4: They don’t know but are having fun guessing. 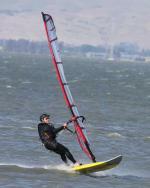 Quickie #5: What about wind power? We hear you are investing in it in a big way. Buffett A5: They are investing in wind all across Iowa like many other utilities. Disclaimer: I own MSFT in my personal account and my “newsletter explore portfolio” with large gains. I may take profits should MSFT stock soar on the news Microsoft walked away from the Yahoo! deal. Sy Harding, editor of a newsletter called "Sy Harding's Street Smart Report", uses a technical indicator called MACD (Moving Average Convergence Divergence) in an attempt to improve on the "Seasons in the Sun" timing system often called "Sell in May and Go Away." Seasonal timing has followers out of the market on May 1 (May Day) with a return to fully invested date of October 31, Halloween. "The Hulbert Financial Digest has been tracking, since May 31, 2002, Harding's record in deviating from the strict version of the Halloween Indicator, and on average he has done markedly better." "To put Harding's success into context, consider that since mid-2002, a buy-and-hold in the stock market has produced a 7.5% annualized return (through April 29). A purely mechanical application of the Halloween Indicator (automatically entering the market on Halloween and exiting on May Day) would have produced a 4.5% annualized return." "Harding's modification of the Halloween Indicator: It produced an 8.7% return (annualized) over the same period, or 4.2 percentage points per year better than a purely mechanical application of this seasonal pattern -- and 1.2 annualized percentage points better than buying and holding. " Harding now says "the exit [from the market pursuant to the Halloween Indicator] could be delayed to as late as May or June if the market's rally off its early March low continues." This video shows what you see out the window on a helicopter flight over Manhattan, New York in March 2007. You can also get a good view of the Financial District in Manhattan, New York with Google Maps.